No criminal charges will be filed. 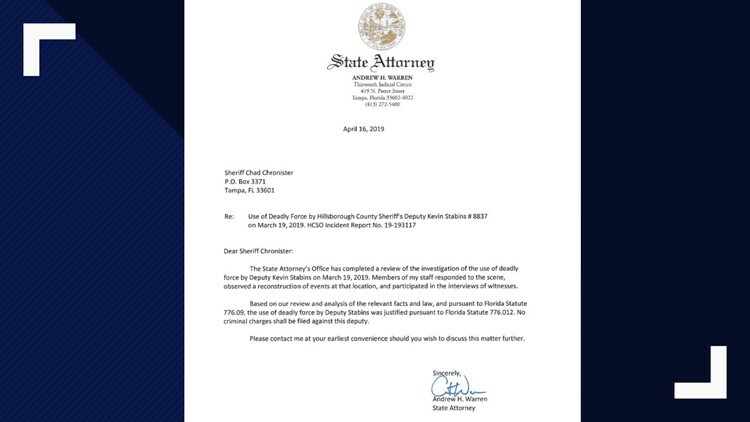 HILLSBOROUGH COUNTY, Fla. — After finishing a review, the State Attorney's Office has justified the use of force by a Hillsborough County deputy who shot and killed a knife-wielding man last month. The State Attorney's Office says it will not be filing criminal charges following an investigation into the shooting involving Hillsborough County Deputy Kevin Stabins, 42. When Stabins responded and tried to get Calderon to drop a knife, Chronister says he refused and aggressively approached the deputy. At that point, he fired his service weapon multiple times -- hitting Calderon. Calderon had been previously taken into emergency mental health custody seven times under the Baker Act. Deputies say this is their eighth call for him acting suicidal with a knife.